Bluetooth Low Energy (BLE) is a Wireless Personal Area network technology aimed at novel applications for smart devices. High-tech BLE profiles and services are being increasingly used by application developers and hardware enthusiasts to allow devices to interact with the surrounding world. This book will focus on a technical introduction to BLE and how it is reshaping small-distance communication. We will start with IoT, where many technologies such as BLE, Zigbee, and IEEE 802.15.4 Mesh will be introduced. The book will present BLE from an engineering perspective, from which the protocol stack, architecture, and layers are discussed. You will learn to implement customized projects for Peripheral/Central communication, BLE Beacons, indoor navigation using triangulation, and the Internet gateway for Bluetooth Low Energy Personal Network, all using various code samples and APIs on Android, iOS, and the Web. Finally, the book will conclude with a glimpse into future technologies destined to be prominent in years to come. 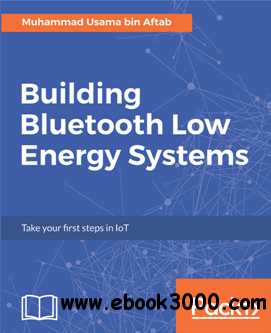 Bluetooth Low Energy in theory. Bluetooth Low Energy Hardware and Software Development Kits. Implement Bluetooth low energy communication (central and peripheral) using Android. Master BLE Beacons with examples implemented over Eddystone and iBeacons. Implement indoor navigation using Estimote Beacons on iOS. Implement Internet gateways to control BLE devices on a Wi-fi network. Understand BLE security mechanisms with a special focus on Bluetooth pairing, bonding, and key exchange to cover encryption, privacy, and user data integrity. Implement Bluetooth Mesh using CSRMesh Technology.